Hi Ashley, why not serve it with rice? I want to make this but I’m a little befuddled as to what to serve with it.. i have a very close minded eater (a grown man, non the less) to keep in mind so nothing to out there. I thought broccoli would be a yummy veg, but I’m at loss for a starch. will be trying this tonight. I’ll let you know how it goes. This is so good, I’m making it again for the second time in three weeks. Thanks for the fantastic recipe! I also added a little bit of sriracha and it was the perfect amount of spice. Made this tonight and loved it. Thanks! You know it’s so funny because as I clicked to open your post, I was thinking, I WISH I still had time to read 🙂 I LOVE that you got the audio book ~ I used to do that for my long commutes and just might have to do that again! MMM looks so yum! i have a piece of steak waiting in my fridge ready to be the third wheel on my date with myself! 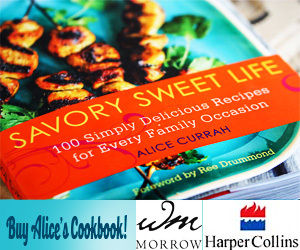 thanks so much for all your recipes Alice! I love many cuts of beef. I’m usually motivated by what’s on sale at the store. Rib-eye is always tender but a little expensive. Top sirloin is an excellent choice with a fair price point. I often buy London Broil because it’s always inexpensive and if prepared correctly, very juicy but doesn’t soak up marinade very well. So I usually do a salt and pepper rub for that cut, cutting it very thinly. I love flank steak and flat iron steak. Very similar in look, but slightly different in texture. Flank is a bit more chewy but absorbs a good marinade very well. Hope this helps! Looks wonderful… what cut of beef do you recommend for the steaks? This looks delicious! How many cups of soy sauce and sherry are needed? Thanks! I still need to get a copy of the book when I go back stateside. As for the recipe, I can see the steak will go well on top of salad. Yum! What a wonderful post, Alice. Ree’s book is on my list to buy, but now I am considering buying the audio version. She is such a wonderful storyteller and I would love to hear this in her own voice. Beautiful photos in the post! I have that book waiting on my nightstand too! Pioneer woman has been an insipation in so many ways, not the least of which is starting my own blog. Can’t wait to try the steak recipe!!! I am going out today and buying this book. I absolutely love The Pioneer Woman and her amusing stories. Can’t wait to read it! This flat iron steak sounds divine. 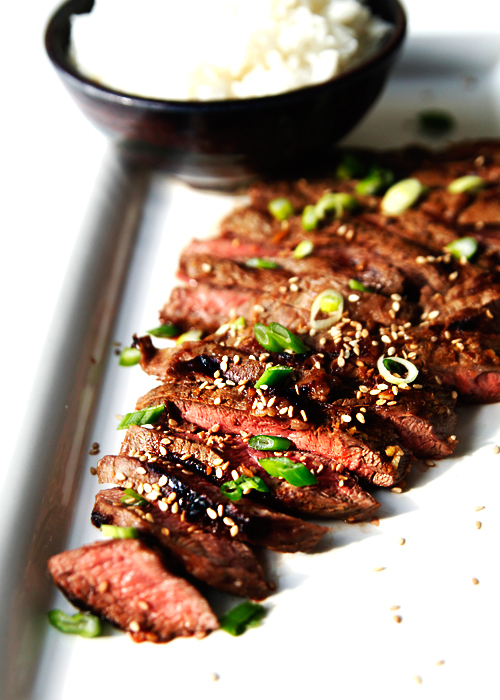 I sometimes use London Broil cut for a marinate/grill but I think I’ll be trying the flat iron steak and Asian-ish marinade. Sounds delicious, especially to me, a ginger-addict. Right there with you on the book – I haven’t so thoroughly enjoyed a love story in a long time! I can imagine the audio book was a real winner. Thanks for the recipe – I’ve loaned out my copy of the book and I’ve been dying for some of her red meat! Looks yummy! O-M-Goodness!!! Beautifully prepared, photoed, and written. ‘Can’t wait to try your version of the recipe or read the book! Alice as always a great recipe. Your pictures say it all! I loved also loved the book. I can relate to so many things Ree has experienced as a newcomer to ranching. I too married a cowboy and there’s so much to learn. You are so right love does conquer all and none of us are exempt from the crazy and difficult things life hands you. Your steak looks so delicious! Your date night with yourself sounds exactly like what I love to do. I have now found blogging but I other passion is downloading movies off of Netflix. My little papillon and I get right in bed with my laptop and watch all kinds of old movies as well as my beloved “Take Home Chef”! I just made “flap steak” tonight. I’ll post about it next weekend. Looks like you made something quite similar. It was delicious! I love the look of that steak almost as much as I love the review. Rather, the fact that I got to hear the review in person last night over a margarita. Or was it a whiskey at the oh so cool gallery party? Even typing that makes my head hurt all over again but cheers to all the friendship lenses the Internet has given us already. Absolutely beautiful recipe Alice. You never fail to amaze me at your pictures, stories and experiences.